For my birthday this year, the very generous (and handsome…he will be proof reading this) Mr R booked a surprise trip for a short getaway, pre-warning me there would be a lot of food involved! He’d booked 6 restaurants for us to eat at over 3 days, plus an extra on the first night, and didn’t reveal to me where we were going until my birthday, a couple of days prior to leaving. After work on Sunday evening (the week before end of spring Bank Holiday) we travelled down to Exeter missing all of the southbound holiday traffic and checking into Hotel Du Vin early evening. What better way to start our mini-break than with a burger! 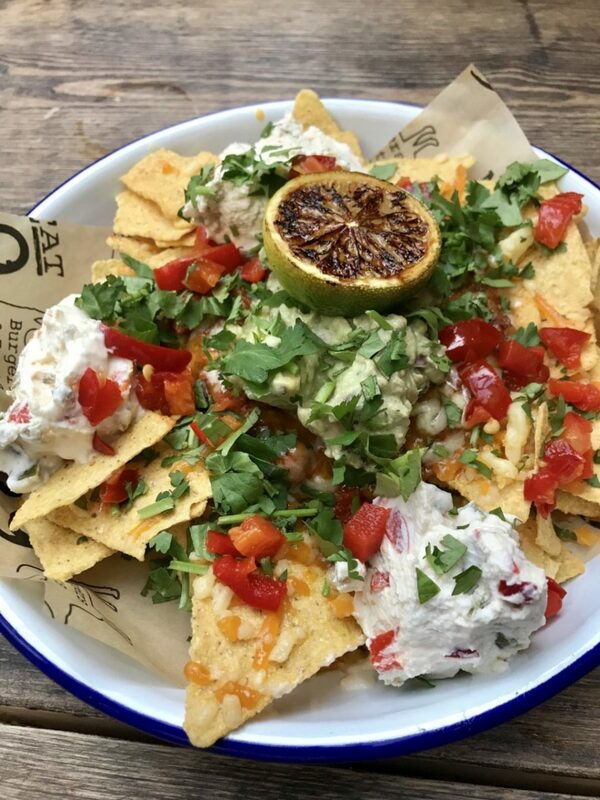 Killer nachos with beef chilli, guacamole, jalapeño cream cheese, mixed cheese, red jalapeños, fresh coriander and lime. 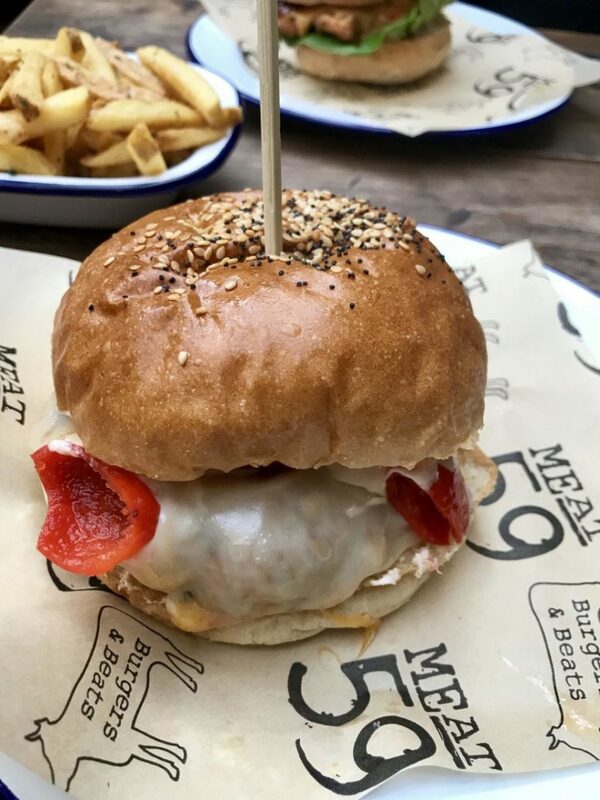 Just a short walk from our hotel we found our Sunday dinner spot at MEAT59, a burger joint that opened in Exeter just over a year ago in April 2017. This being the second of two restaurants created by sister and brother-in-law Jenna and Vince, with the first being established a few years earlier in Torquay. You know I love a burger, so I was thoroughly excited to be trying somewhere new for my birthday. We were surprised by how busy it was, but even though there only seemed to be one waitress serving when we arrived, we managed to get a seat upstairs, with a little bit of a wait to be given menus and drinks. ‘Alabama Slammer’ – Southern spiced crispy chicken breast, M59 mayo, gem lettuce, red jalapeños, Mexican chilli cheddar, BBQ sauce. The killer nachos with beef chilli, guacamole, jalapeño cream cheese, mixed cheese, red jalapeños, fresh coriander and lime (£9) came out quickly after ordering and hit the spot after our longish drive. We rationed ourselves to a portion of 6 halloumi fries (£5.25) rather than 12 (£10) to share and wolfed them down with the homemade chilli jam – delicious. 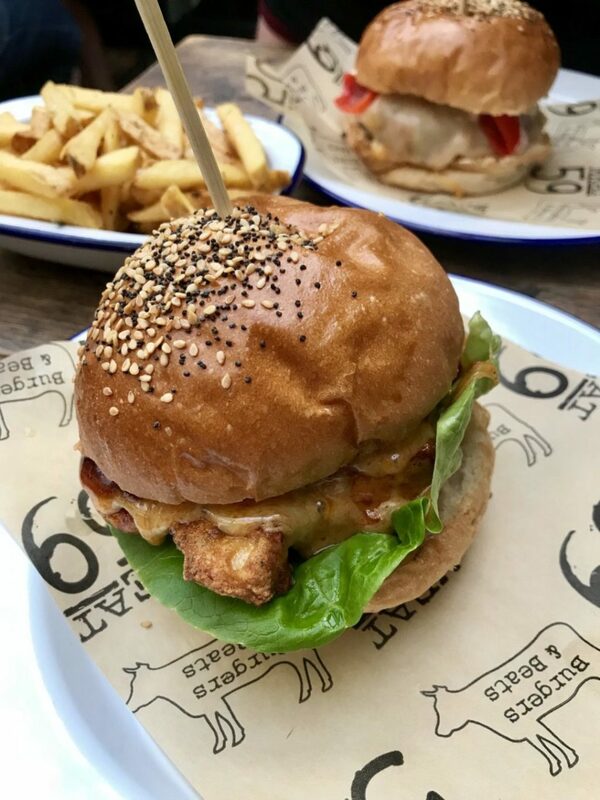 Our waitress was too busy to tell us about the May special burger, but we’d spotted the ‘Alabama Slammer’ (price unknown) on the board outside when we came in – A Southern spiced crispy chicken breast, M59 mayo, gem lettuce, red jalapeños, Mexican chilli cheddar, BBQ sauce. As well as getting the special we also fancied something meaty so went with the ‘raging bull’ (£9.50) – 6oz hamburger patty, roasted jalapeño cream cheese, extra hot Mexican style chilli cheddar (made in Somerset), piquant peppers, fresh jalapeños, chipotle mayo and swapped out the rocket for extra mozzarella (£1). It does sound like a lot of jalapeños going on there, but for us the heat was just right. Slicing both in half we munched our burgers along with a side order of fries sprinkled with rosemary salt (£2.75). The beef burger patty made with bacon had a strong flavour and one of individual presence. For us the best of the two hands down was the chicken burger, although we really enjoyed all of the food at MEAT59 and it was a great start to our little holiday. Shout out to the staff too who were super friendly, albeit super busy too. We were up early the next morning and despite having planned a swim in the outside pool of the hotel, we got on the road to get to Padstow early for an explore before lunch. It has to be close to 10 years since I was last in Padstow and I still remember the incredible prawns we bought from Stein’s Fish & Chips. Gosh, I remember picking up a menu from The Seafood Restaurant as at the time they put them in a basket outside for people to take as souvenirs. I disposed of it a few years later when it occurred to me that it wasn’t much of a souvenir as I hadn’t actually eaten there at the time, and couldn’t really afford to so it was as close as I got back then. With an hour and a half to spare we dropped our bags with reception at The Metropole Hotel and made our way over to the National Lobster Hatchery on the harbour. Inside is a very educational visitor centre where you can learn all about sustainability issues faced by coastal fisheries and how consumers, fishmongers and restaurants can all help. You can even adopt your own baby lobster and track it to find out where it finally gets released. Back outside in the sunshine and we found ourselves in search of a pre lunch cocktail, and on the way popped into the Padstow Food Fair inside the memorial hall. As we were away for another couple of days we didn’t want to risk buying any food products that might not make it home, but managed to get our hands on a new bottle of gin to add to the new gin shelf. Elemental is a Cornish gin, and although you can buy it online we couldn’t resist taking a bottle home with us. Then after a quick ‘Bin ‘n’ tonic Tarquin’s gin cocktail and glass of wine at Bin Two we headed across to the square for lunch. 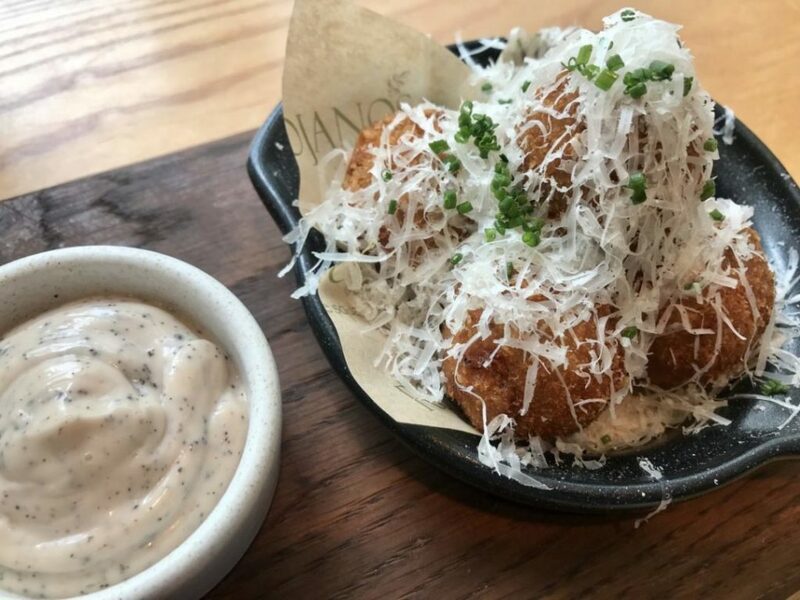 Sicilian arancini – crisp bolognese and parmesan risotto, truffle, Madeira mayonnaise. 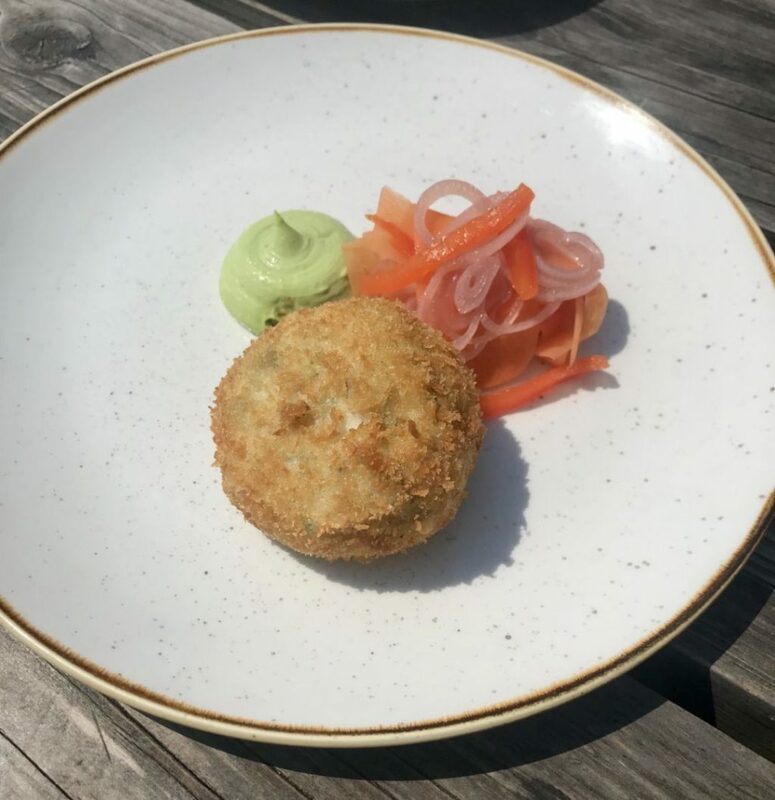 Padstow is renowned for its foodie scene, so when you’re only staying in the area for two days and you’re a foodie, you’ve really got to make the most of it. 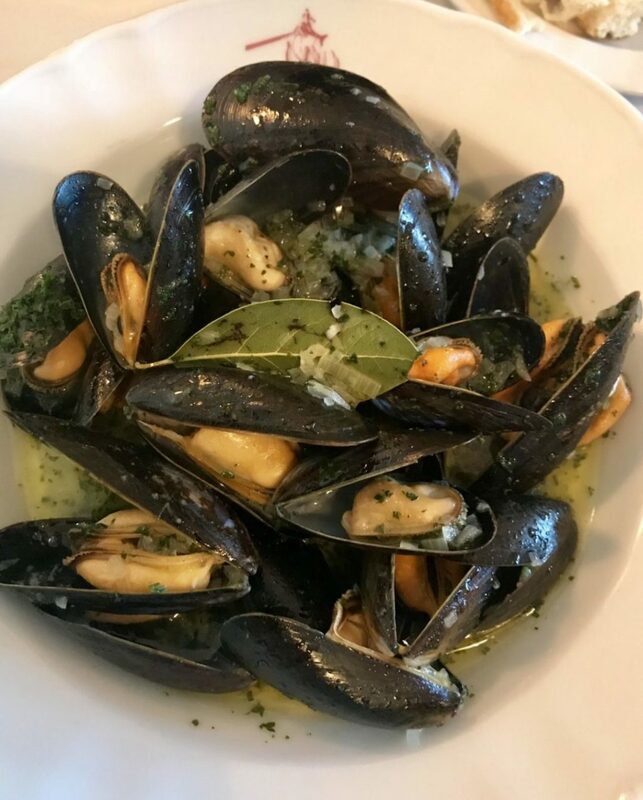 We started our food journey in the seaside town by stopping for lunch at Rojano’s in the Square; an informal and relaxed restaurant in the heart of Padstow serving Italian / Mediterranean cuisine. Today the eighteenth century building is owned by the Paul Ainsworth group, but keeps its name from when the restaurant was first opened by Stanley Rojano in 1974. We love Italian food so I was very happy when I found out this was on the list during our time in Cornwall. ‘Funghi’ pizza – Gorgonzola, portabello mushrooms, parma ham, aged balsamic, lemon zest, spinach instead of rocket. The plan was to try and be a little sensible at lunch as we were eating two big meals a day, but since we’d skipped breakfast, travelled a fair way in the morning and already had a cocktail, the plan had soon been abandoned. Especially when we saw the Sicilian arancini (£9.50) filled with crisp bolognese and parmesan risotto, truffle with a side of Madeira mayonnaise. I don’t think we even read the other starters before ordering a portion to share, so I guess you could say we were kind of being sensible. I decided to ignore the burgers as we’d eaten one the night before and the fish as I had been told what was coming next on the trip, so this was a great excuse to order some pizza. I’d also seen on Instagram that ‘The Pizza Crew’ had been here a few days before and picked up a Fiorentina takeaway which looked sublime. 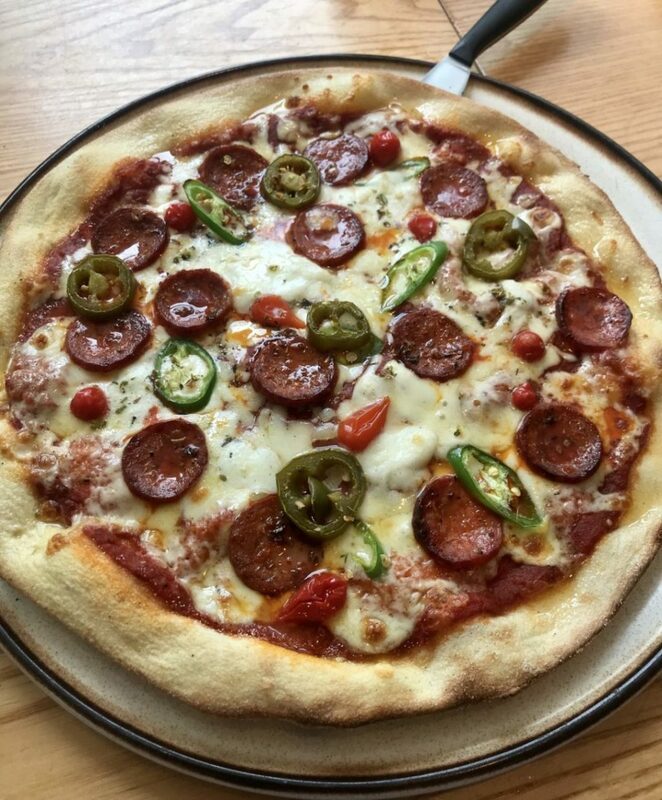 ‘Diavola’ pizza – Salami, roquito peppers, green chillies, jalapeños. We decided upon two pizza choices and divided them in half. The ‘Funghi’ pizza (£15.95) had a white base of crème fraiche, garlic and parsley. 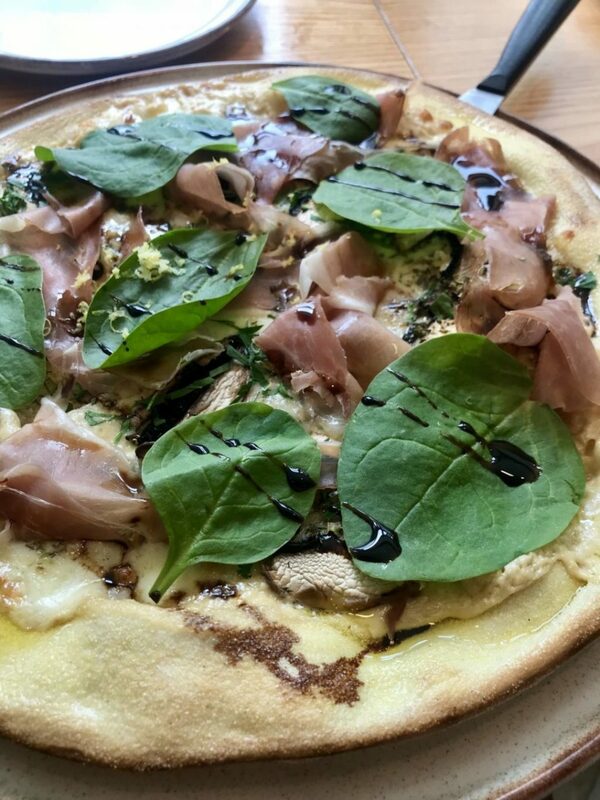 It was topped with Gorgonzola, portabello mushrooms, Parma ham, aged balsamic, lemon zest, and we swapped the rocket for a handful of fresh spinach. In complete contrast the ‘Diavola’ pizza (£11.95) was super spicy and was generously topped with salami, roquito peppers, green chillies and jalapeños. Both were really great pizzas, although I think the ‘Funghi’ may have ever so slightly have been our favourite of the two. With a whole afternoon in the sunshine to spare, we walked some more, browsed the shops and eventually found ourselves at Stein’s Fisheries & Seafood Bar after having spotting it when walking past shortly after we’d arrived that morning. 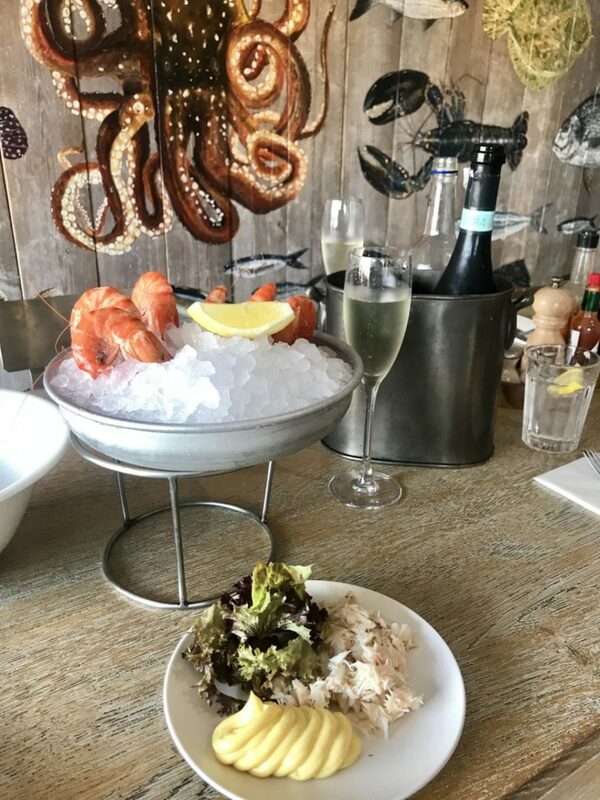 With a bottle of prosecco on ice, we sat next to the open doors watching the world go by and snacking on some fresh white crab meat (can’t remember the price) and six tiger prawns (£12). The seafood platter sounded like a must, but we still needed to squeeze in dinner later. 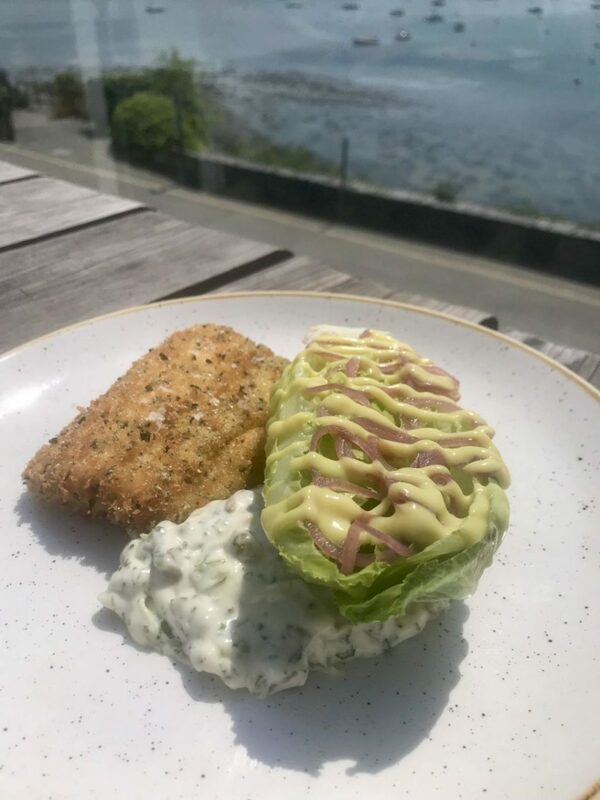 As with the new Barnaby’s Bistro and Prawn on the Lawn (both owned by husband and wife, Katie & Rick Toogood) that had popped up since our last visit, we realised there was a whole other foodie trip to be done here in Padstow. Before going back to our hotel to check in and freshen up, we stumbled across the new Ruby’s Bar for a glass of wine and a cocktail. This bar is a must if you’re staying in Padstow as Jill and Rick Stein have collaborated with award winning bartender, Mr Lyan to offer an exclusive range of cocktails as well as some superb gins, craft beers and special wines. Over 18’s only. Langoustines on ice, freshly caught from the west coast of Scotland. Mr R had booked us an early dinner that night at The Seafood Restaurant, which happened to be conveniently located at the bottom of the steps leading from our hotel. Opened over 40 year ago by Jill and Rick Stein, The Seafood Restaurant is renowned internationally. Although you might not see either of them during your visit, today Stephane Delourme heads up the kitchen, and the team create seafood dishes based on Rick’s famous recipes combined with the daily catch from Padstow’s boats. Once seated in the conservatory everything felt a little rushed to start with. 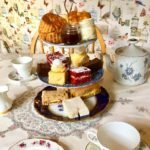 The staff were polite and friendly, but it was as if we were being hurried along and this made me a little uncomfortable as we were on holiday and for today at least, we had all of the time in the world. The menu is really quite long and we needed time to read through and absorb everything, so we had to keep sending our waiter away after every couple of minutes or so we were checked on. After making our decisions and a quick aperitif and complimentary pre-dinner snack, we were shown through to the restaurant. 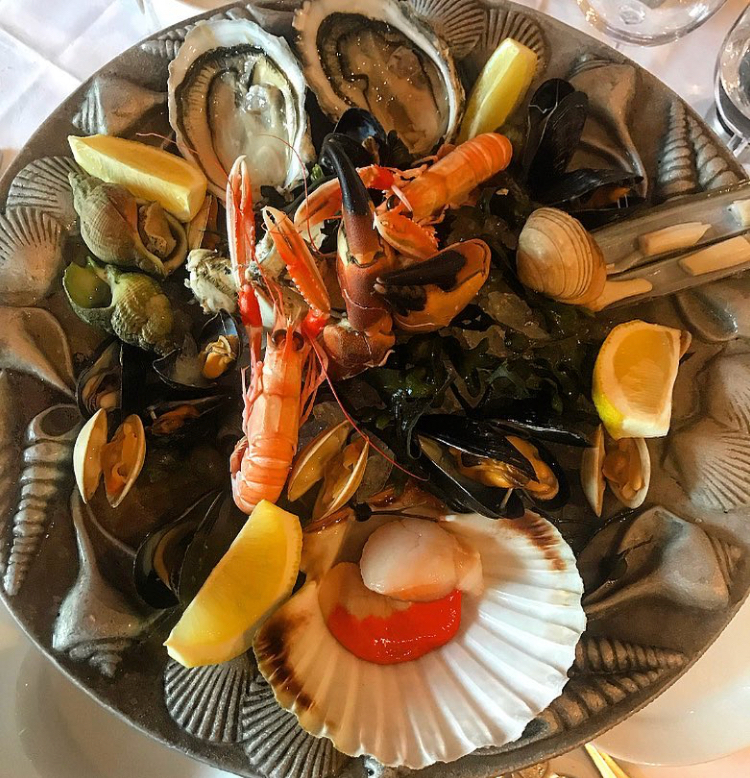 A Small “Fruits de Mer” – Mussels, winkles, brown crab claw, scallop, oyster, whelks, clams, razor clam and langoustine. The room was huge and not at all what I had expected, probably less formal than I might have imagined all of those years ago looking at prices in the window that I just couldn’t afford. The vibe was really relaxed and the restaurant was already completely full with people having a joyous time. 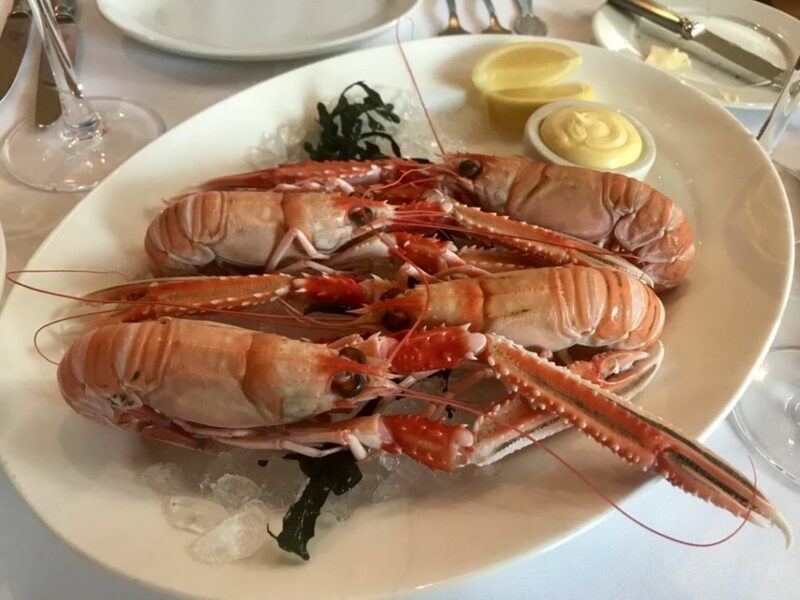 We had ordered four Scottish langoustines on ice (£36) and joked with one of our servers about how we were going to fit everything on the table along with the bread, water, white and red wine. Once in the restaurant there was no longer a sense of being rushed, entirely the opposite in fact. Shelling langoustine is no quick feat! There was a long and welcomed break before our second first course of Scallops Vieiras Al Horno (£16.50) and a small “Fruits de Mer” (£29.50). My Galician style scallops arrived first and there seemed to be a long wait on Mr R’s order so I went ahead and ate them whilst they were still hot. The scallops had been baked in their shells with red peppers, Guindilla peppers, chorizo and crispy breadcrumbs. They were pretty good, however the “Fruits de Mer” was a real show stopper. I helped with the white crab meat, but left my fiancé to the rest as this was his idea of heaven. For main course I went with the Sea Bass Pollichathu (£28.50), a whole fish baked in a banana leaf and apparently a favourite dish for our waitress. The sea bass came boned and stuffed with a masala made with curry leaves, green chillies, onion and turmeric. It was served with pilau rice and a tomato, red onion and coriander salad. An enjoyable dish, but in all honesty it didn’t wow me quite as much as I had hoped. 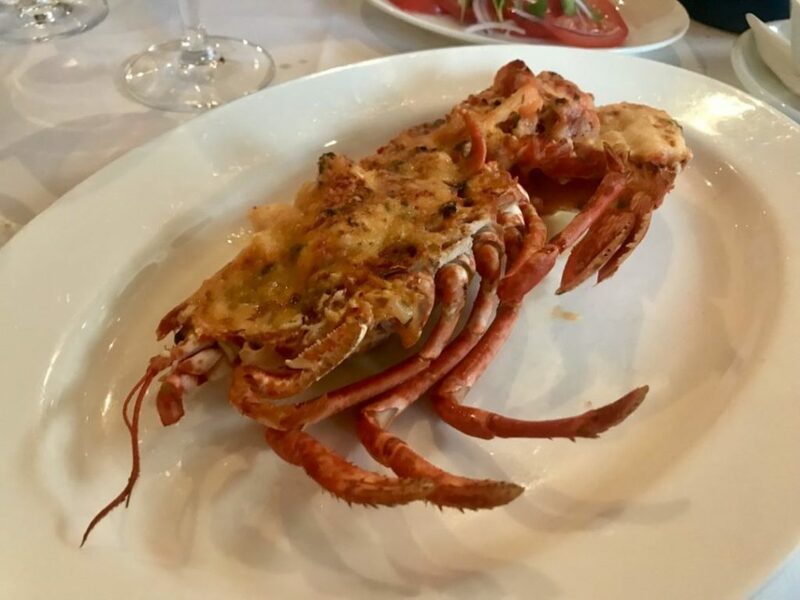 The fragrant half Lobster Thermador (£41.50) across the table was a huge hit. Suddenly 3 hours had passed in a flash as we were having such a good time, aided also by the fun and warming staff. Comments had been made to us by friends and acquaintances about how we were wasting our money by eating at The Seafood Restaurant when Stein’s Chip Shop was just as good for a fraction of the price. I take on board their view, but having now done both, we thoroughly enjoyed the restaurant experience. Although it was a pricey meal, it was our holiday and our choice. 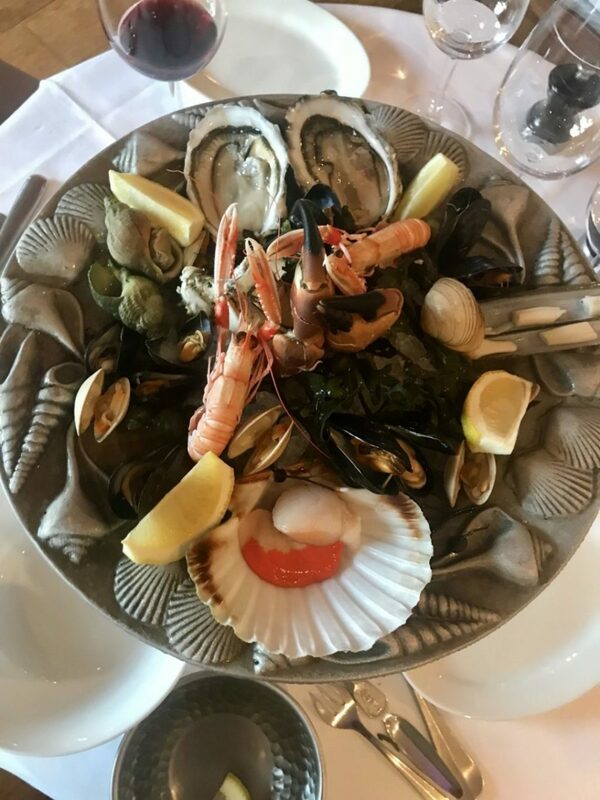 The staff in the restaurant went over and above (one in particular – sadly we don’t have her name as another server is stamped on the receipt), to make our evening special and we’d had the best “Fruits de Mer” we’re likely to ever see. Another day, another foodie adventure. We woke up the next morning in Padstow ready for more walking, good weather, drinks and fine food. To get to our lunchtime destination we had to catch a small ferry from Padstow harbour over the Camel estuary. 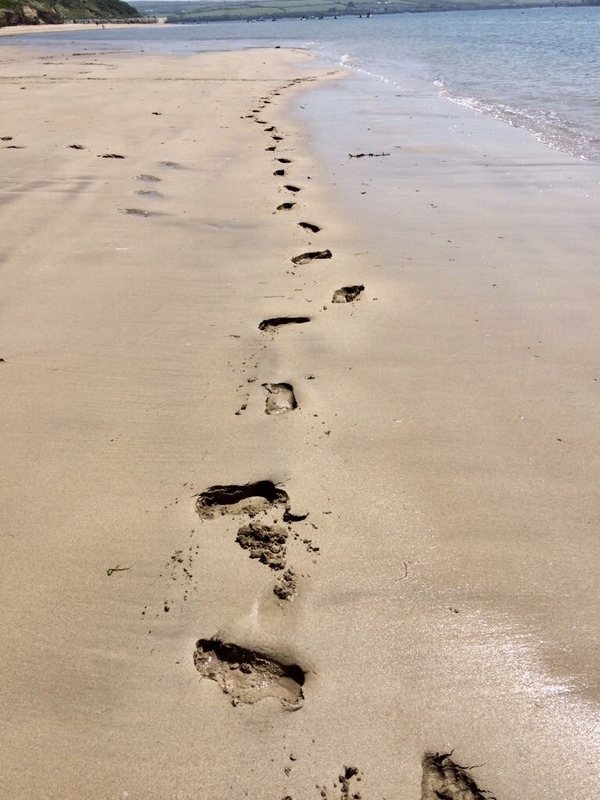 After a short boat trip, we were dropped off next to the beach and we had plenty of time before lunch so took a long walk along the golden sandy shores. We even saw a jelly fish! Somehow ravenous again, we strolled through the village to our destination more than ready for a few refreshing beverages and our next fill. There wasn’t a hope in hell of us getting a table at Restaurant Nathan Outlaw in Port Isaac, so for our first Outlaw experience we would be going to The Mariners. I’d heard this place described as a pub, in fact Sharp’s Brewery’s only pub and in collaboration with Nathan Outlaw. We arrived at what wasn’t really a pub, more of a bar which was very nice, but didn’t really have that welcoming pub feel that I think I had in mind. Mr R sampled one of the beers on offer and I had a Tarquin’s gin, something I’d already had plenty of on this trip so far, but this one had apparently been made with the same hop as one of the beers, and it actually did taste like beer. We had a table booked and we were told by the bar staff that it would be upstairs. We just had to let them know when we were ready and that we could also request to sit outside. We found ourselves the perfect spot overlooking the Estuary and basked in the sun. A bottle of white and a bottle of prosecco on order and as far as we were concerned we were set for the afternoon. Our waitress Ellie was really helpful and friendly and gave us all of the information about the specials available that day. We got some bread (£4) on the go as the sourdough really is a thing locally and it’s just so good. To start I went with the fish cake (£8.50), pickled vegetables, jalepeno mayonnaise and Mr R had a plate of crispy oysters (£10). 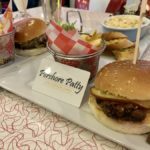 Both were great dishes and we thought the menu was priced very reasonably, particularly as we had expectations of it being a little more on the expensive side. I moved onto more breaded fish for my main as I fancied fish and chips, so opted for the hake (£17.50) with tartare sauce, gem salad and a side of cheesy fries (£4) which I had a little help with. We also had a side of delicious tenderstem broccoli seasoned with hazelnut, chilli & garlic (£4), and this went perfectly with Mr R’s filleted John Dory (£12.50) from the specials. 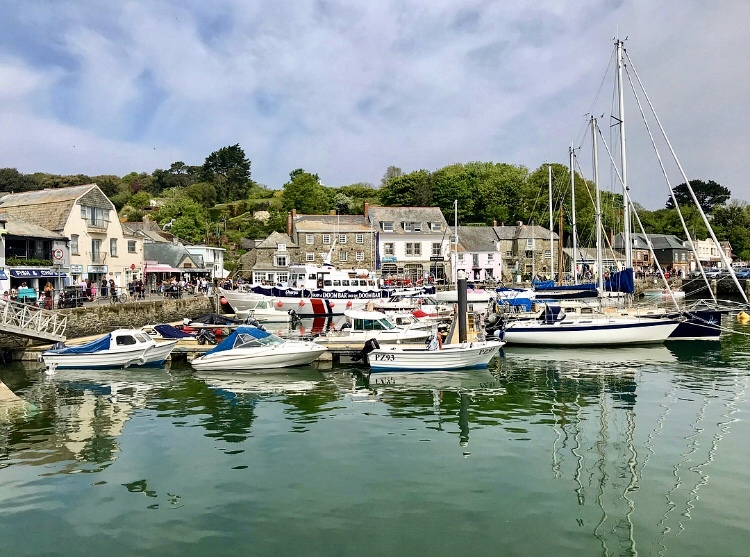 We just loved sitting in the sunshine absorbing the beautiful, peaceful surroundings of Rock, whilst looking across the water and thinking of all of the hundreds of people shuffling around the little town of Padstow. So far this had been the most enjoyable day of our little holiday, but it seemed to just get better. On our last night in Padstow, Mr R had booked a special birthday treat; we were going to Paul Ainsworth at No. 6. The restaurant was awarded a Michelin star in 2013 and has four AA Rosettes. It is also listed as one of the Top 50 restaurants (no. 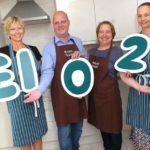 32) in the Good Food Guide 2018 and was voted in at no. 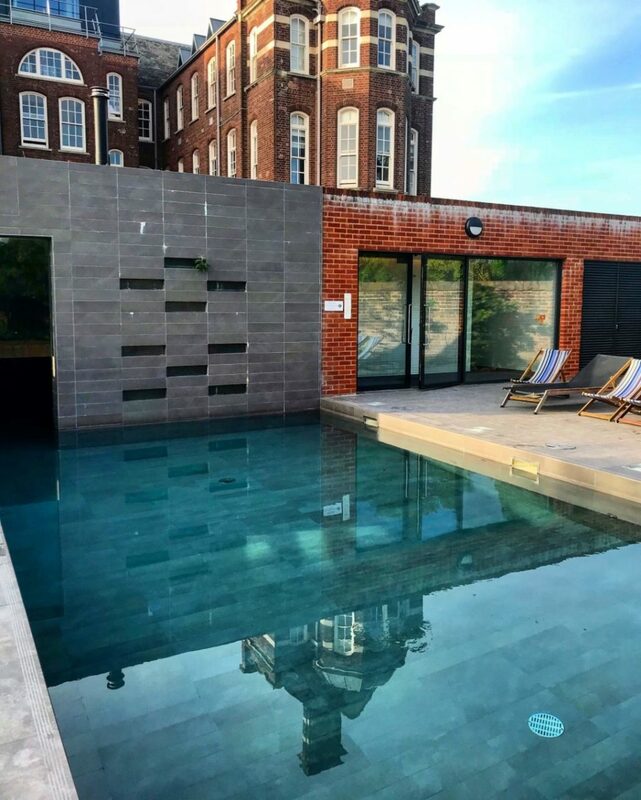 17 in the recently published UK top 100 restaurants 2018 by SquareMeal. To say I was looking forward to this would be a huge understatement. We had been told the day before by the bar man at Ruby’s Bar that we had to try and get into the new upstairs bar at No.6, which wasn’t made too difficult as we were taken straight there as soon as we arrived for a pre-dinner drink. In CiCi’s Bar Mr R had a Koniks Berry and my Rhubarb Fling was honestly one of the best cocktails I’ve ever had. As good as they were, we stopped at one and made our way downstairs to the restaurant area. We were served by Alex at our corner table overlooking the main restaurant. It took us some time to make a choice between the 5 starters and 5 main courses listed and Alex was able to help us with a few questions we had about the menu. Our main one being about the rib of beef which we both fancied sharing, but had the dilemma of Mr R liking his steak rare and me preferring it more on the medium side. Thankfully this was resolved by Alex explaining that the way this cut is cooked by the kitchen, it actually covers both. He even bought one out for us to see the incredible marbling and we talked about the smell which was almost gamey. Main course settled, Mr R started with the Jacob’s ragu alla Bolognese (£13) and I went with the smoked haddock (£16), but not before enjoying some freshly baked bread and a crispy oyster the Cornish way. Of course this was a Michelin starred restaurant so not everything was as it first seemed and there were a few surprises along the way. Mr R really had left the best for last, everything about the food, ambience, décor and service at No. 6 was exceptional and we were made to feel very welcome by everybody. I don’t recall having ever eaten a piece of beef that was as tender, flavoursome and well cooked as this one. I also admired how the pommes anna that came with it resembled a tarte tatin with its shiny and almost caramel glaze. The parmesan taco Caesar salad was no ordinary Caesar salad, it was exceptional. Everything had its own mark and unique twist. 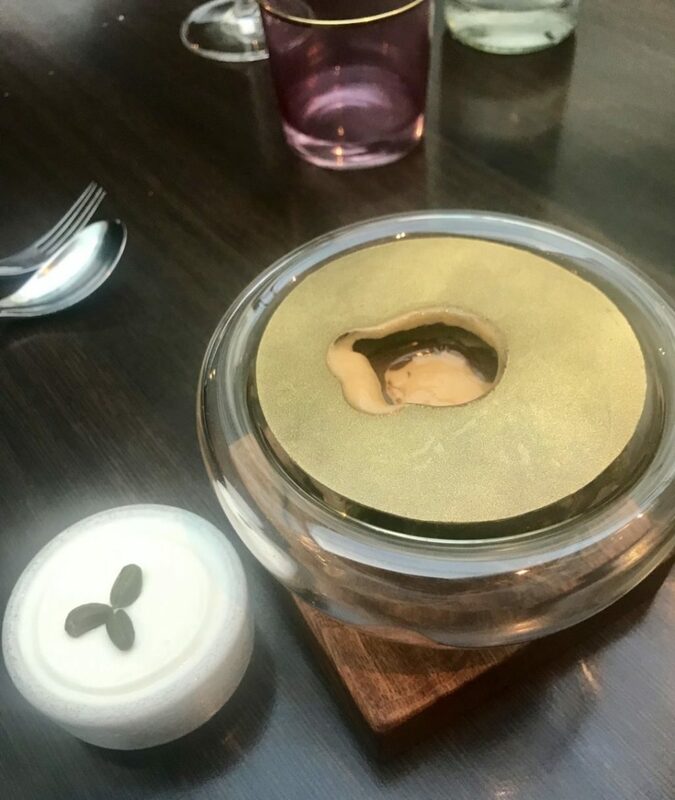 Hot melted caramac was poured onto our chocolate dessert and we were advised that it was best to eat together with the yoghurt to enjoy the contrast of sweetness and acidity. After dinner Alex invited us into the kitchen where we met senior sous chef Chris McClurg and the team. We missed Paul Ainsworth this time as I’m pretty sure he was in Marlow at Pub in the Park. Our time in Padstow had come to an end, but our foodie holiday wasn’t quite over yet. We woke up early on the last day of our trip ready to move on for one more stop on the way home. 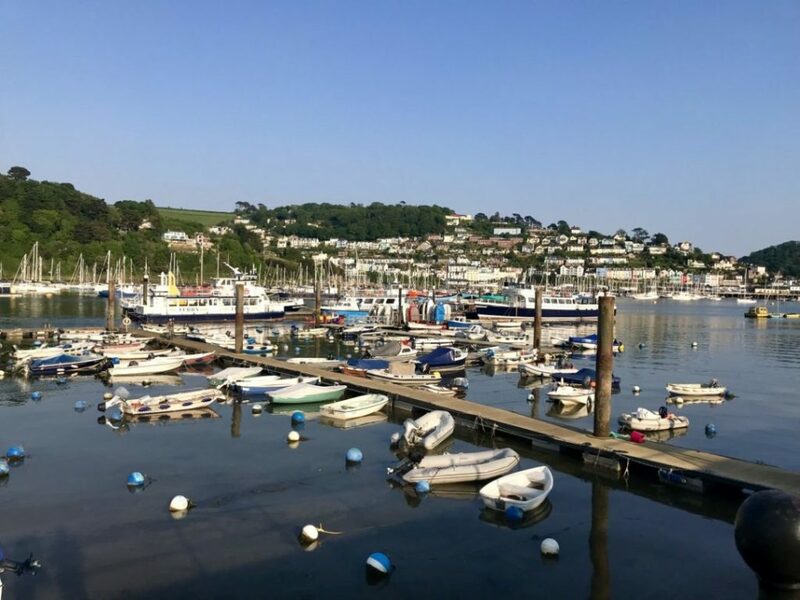 Last year we had visited Dartmouth, again around my birthday as Mr R wanted to take me to a restaurant that he’d hoped I’d love as much as he did – The Seahorse. Needless to say that I did and this is one of the main reasons for coming back. The weather was still on our side and the town was quiet with it being a few days before the Bank Holiday tourists made their way this far south. It felt as if we had the place to ourselves and we enjoyed every moment of it. Lunch was booked at Rockfish, as again we’d eaten here last year and thought it was fab! 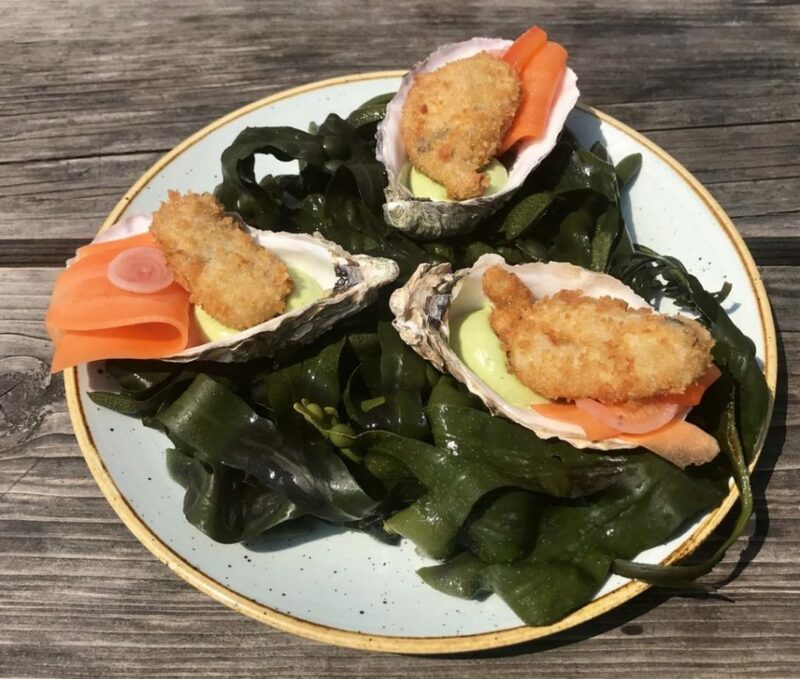 The Rockfish name has grown into a small independent seafood chain since the first one was opened in 2010 by Matt Prowse and Mitch Tonks. There are now six restaurants located in seaside towns, with Dartmouth being the first. I’d remembered the fish tacos from our last visit and couldn’t wait to have them again. There’s a really casual and easy feel here, making it a place to go for families, couples, and dogs are welcome too. The restaurant is kitted out in a beach shack style, the ceilings are covered with fishy pictures coloured by children and the shipping forecast is piped in the loos (although have to say they could do with a refurb or a very good clean as were noticeably pongy). I’ve mentioned it loads, but it was my birthday and we were on holiday and as we didn’t have to drive anywhere for the rest of the day we were unashamedly making the most of it. Mr R ordered a bottle of white wine and I ordered a bottle of prosecco to slurp through during our lunch, which our waitress Joanie found hilarious. We explained to her that it was my birthday and she came back with a card for me signed by her and all of the team – what a complete sweetheart. Our prawn tacos (£13.95) arrived in good time and we shared them as a starter. 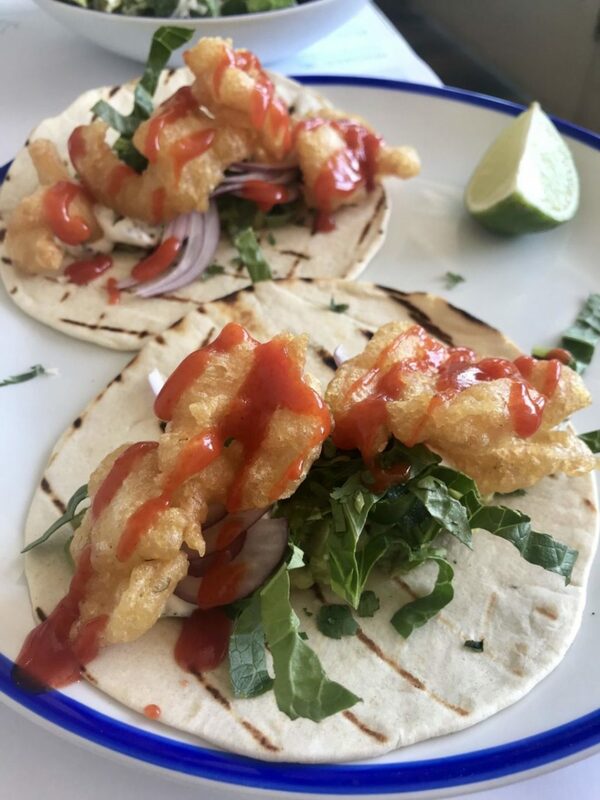 The crispy king prawns came with guacamole, red onion, fresh lime, chilli, yoghurt, mint, coriander, in a grilled flour tortilla and were delicious. As they were a main course, they also came with unlimited chips, but we ordered a Caesar salad (£3) and Greek salad (£4) instead to go with our main meals. 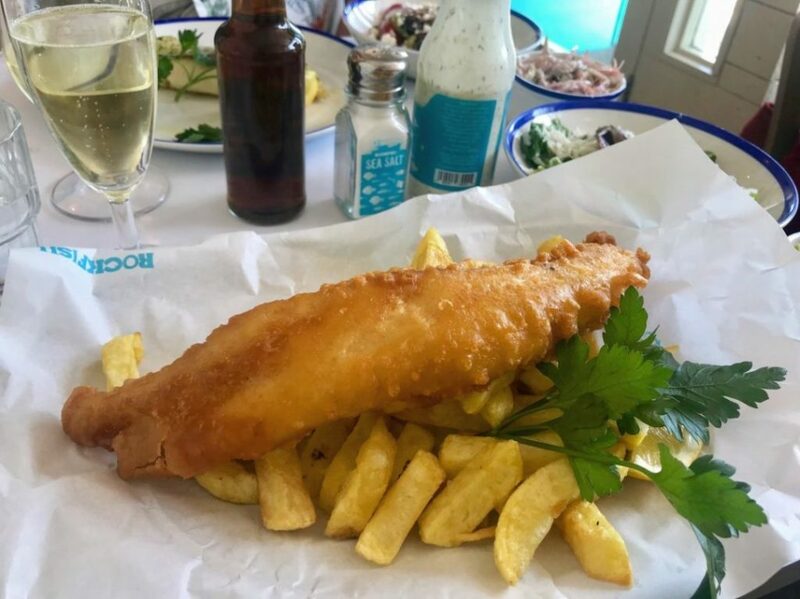 At Rockfish their motto is “tomorrows fish is still in the sea” and as well as the main menu, they give each customer a fresh paper menu / place setting with a list of various types of fish. Our waitress Joanie circled everything that was available that day and told us the prices as well as what worked best grilled or battered. 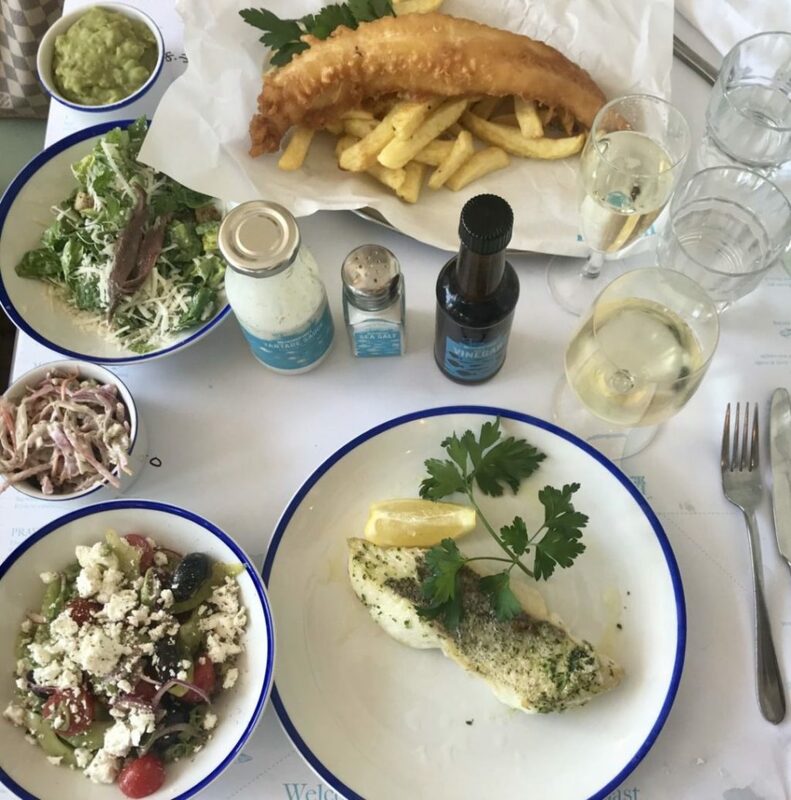 Mr R went with the healthier option of the local Hake (£13.95) and decided to have it chargrilled with his Greek salad, whereas I chose the Norway cod fillet (13.95) battered with chips. We couldn’t resist some jalepeno slaw (£2.50) which we’d highly recommend, but only if you like spicy, and some mushy peas (£1.25). Maybe we did go a little overboard (excuse the pun), but we had an absolute hoot with Joanie who made us laugh throughout the whole meal and our fish, chips and salads were excellent. 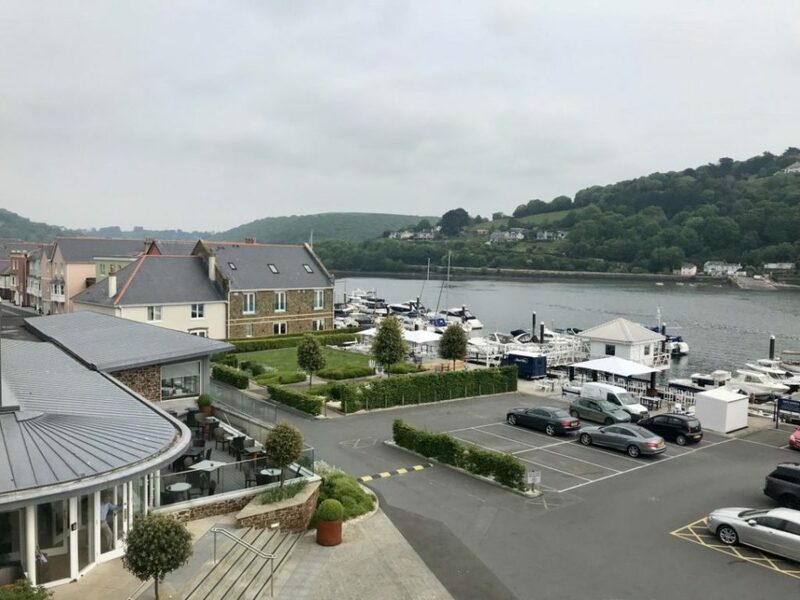 An extra birthday surprise arrived when we got to our hotel, The Dart Marina as Mr R had splashed out on a deluxe balcony room overlooking the River Dart. After lunch, a stroll, some shopping and a cocktail or two, we made our way up to the room for a champagne toast and admired the views. There was still time to have a dip in the pool and hot tub before getting ready for yet more food, and our final dinner of the holiday before travelling back home the following morning. I was ecstatic to learn that we would of course be going to The Seahorse, a restaurant that has for us become ‘ours’ for a number of reasons and is quite special to us. 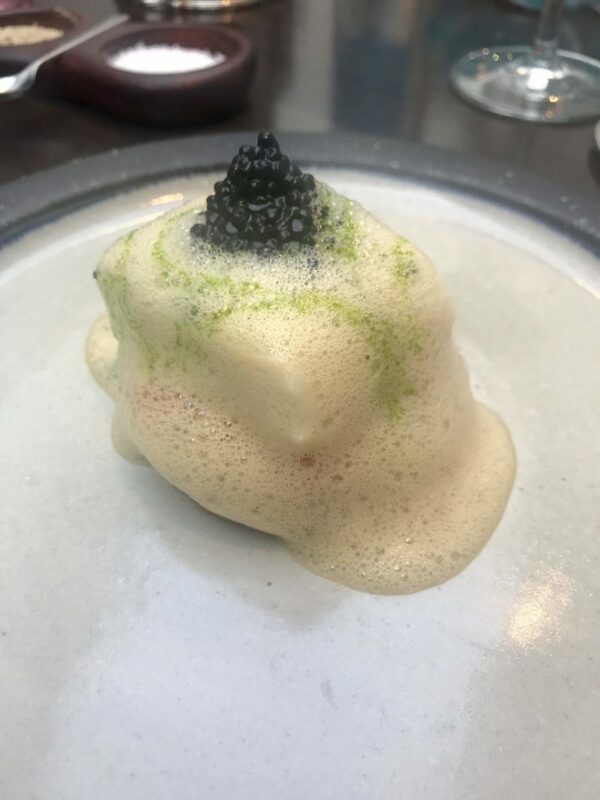 This is a restaurant that is listed just about everywhere worth being listed as one of the UK’s best and we couldn’t agree more. It’s not just about the food (which is superb by the way), but also about the people. Last year we had booked in on a Saturday night and we were told (can’t remember by who) that Mitch Tonks is often seen making an appearance on a Saturday evening in the restaurant. We were lucky enough to meet him and sat in Joe’s bar after our meal where his wife Penelope had been waiting for him until after closing. We have fond memories of staying in the bar late drinking wine and enjoying the evening. 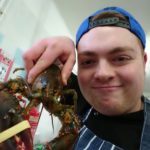 I’d posted photos on my Instagram account of our amazing food and was delighted to have received a follow from sous chef Matt. Over the past year I saw picture after picture of his incredible plates of food pop up on my feed and I had been desperate to go back ever since. I ended up ordering the same dishes as our previous visit, although this was not intentional, maybe it was somehow unconsciously reminiscent. To start I enjoyed the scallops roasted in their shells with white port and garlic (£14.50) which were undeniably more memorable (and less pricey) than the scallops I’d eaten in another seafood restaurant just 2 days earlier. Mr R’s starter of Coze a vapore (£10) – bay mussels steamed with vermentino wine, bay & chilli were also excellent. Everything seemed to have alcohol included on this menu, where they trying to get us drunk? We had a direct view into the kitchen from our table and I recognised sous chef Matt, I think he recognised me too. I had hoped to try and say hello before leaving as he was part of the reason I felt so welcomed back to The Seahorse. 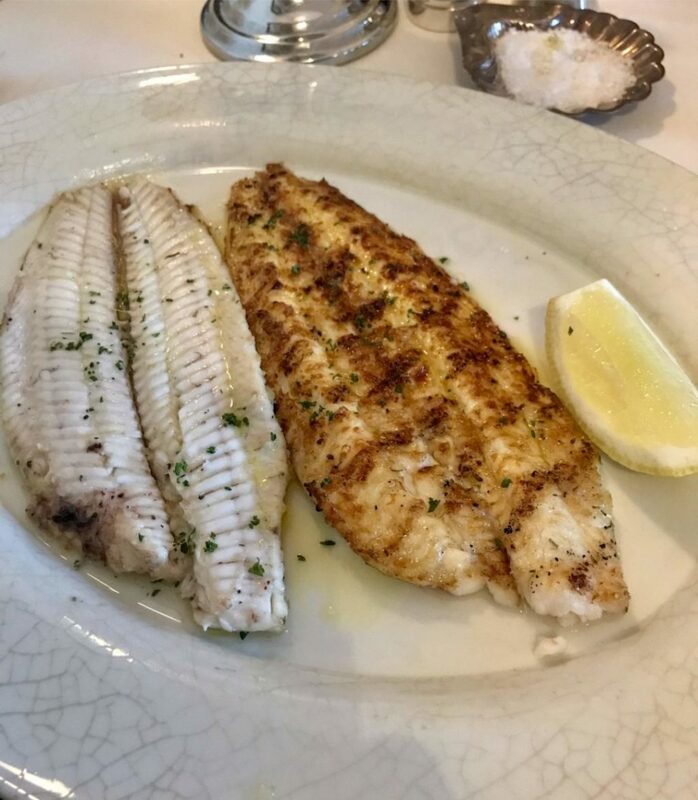 There were so many fantastic choices on the day’s menu, but I still went with the Dover sole (£35) as I loved the texture of the fish and flavours from the charcoal oven. 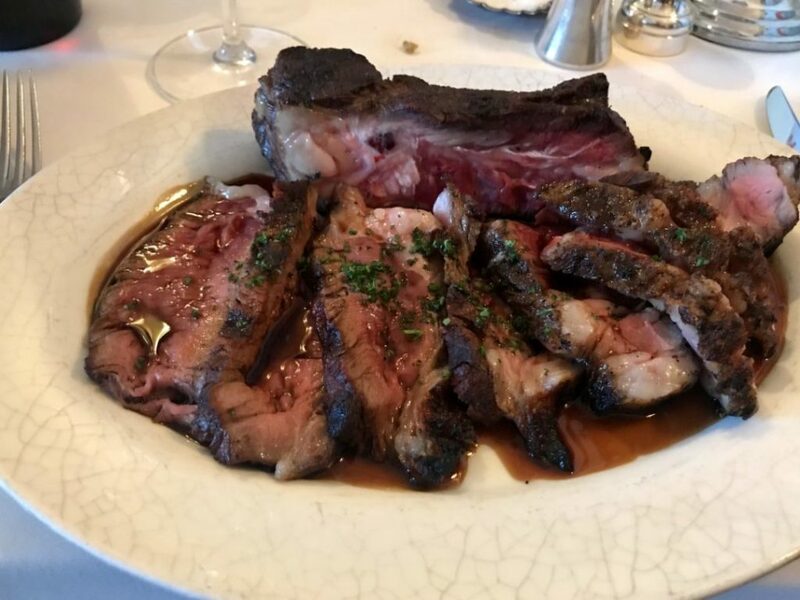 I also knew that I could also ask for it to be filleted without any embarrassment, as this is a restaurant that makes all of its customers feel like part of the family. 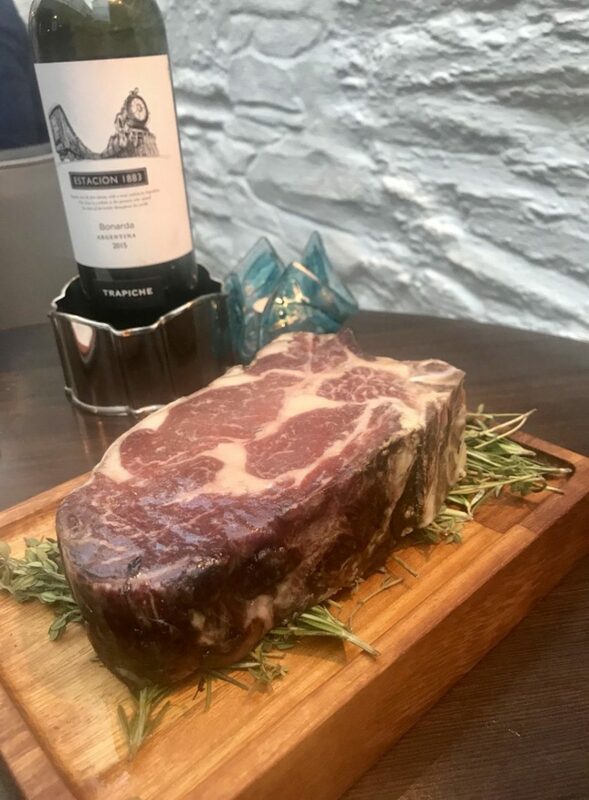 Despite having a huge rib of beef the night before at Paul Ainsworth’s in Padstow, Mr R was back on the meat and ordered the rib of salt aged Glenarm Estate beef (£40), it had also been roasted over the charcoal and then carved off the bone. We had a side of slow cooked fennel with lemon & basil (£4) and some fried confit potatoes (£4). The potatoes were definitely not needed, albeit very tasty. We were completely stuffed and satisfied so declined dessert – we’d had the cheese last year which was amazing. There was just no more room, but then Matt sent us over a little dessert – he had recognised me. Afterwards as we walked to the back of the restaurant into Joe’s bar we stopped at the pass to say ‘hi’ and ‘thank you’ to Matt and for the incredible food. We then retired with the company of the lovely Gabriella who entertained us until it was time to kick us out. We also spent time chatting with Cantina and bar manager Sarah (and her husband) who told us about the new private dining room next door that can be hired for parties of up to 14 people. 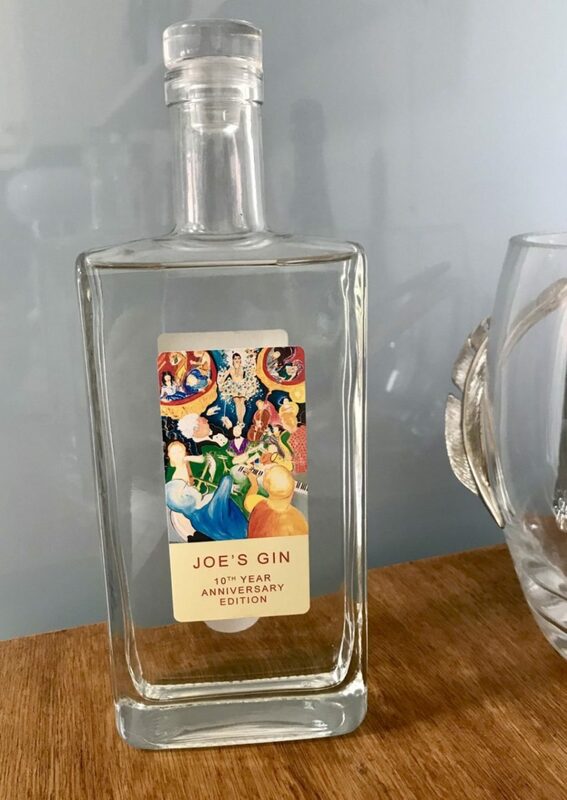 Gabriella introduced us to ‘Joe’s gin’, a gin created by their barman at Joe’s. We bought a bottle to take home and ours was labelled as a 10th year anniversary edition, in celebration of the 10th year of Mitch Tonks opening The Seahorse. We were told that the celebrations are going on all year, we only wish we were able to come back and enjoy them. We left feeling even more part of the family having made some new friends, and we sincerely hope to see them all there again next year. 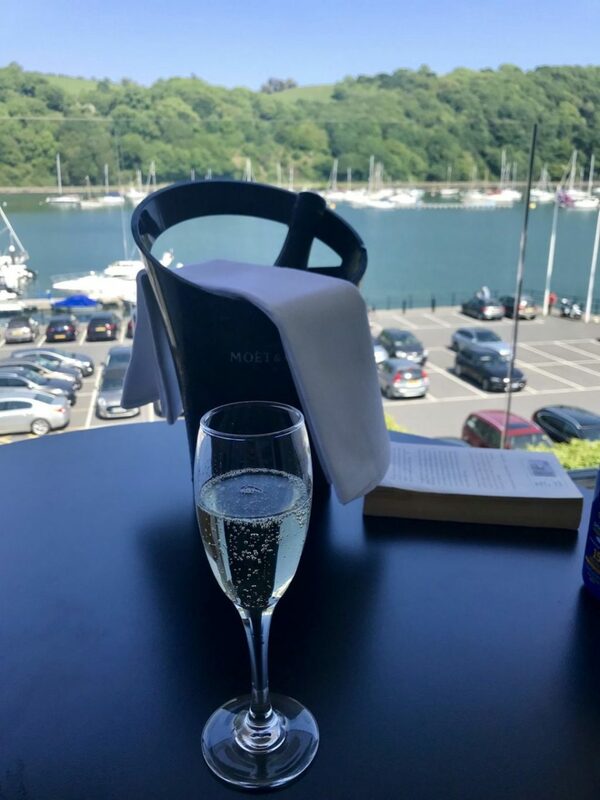 It was our last morning, and with slightly fuzzy heads from the night before we woke up early so we could enjoy the spa, gorgeous stand-alone bath in the room and for the last time this year, those stunning waterside views of the River Dart. Our trip to Cornwall and Devon was very brief, but I’m sure you will agree that we made the very best of our time there. Hopefully we’ve given you a few ideas of where to eat when you’re next in the area too.